As the topic of the online tracking and privacy becomes increasingly sensitive, some national governments try to regulate this. However, as it often happens, the implementation of new laws leaves much to be desired. 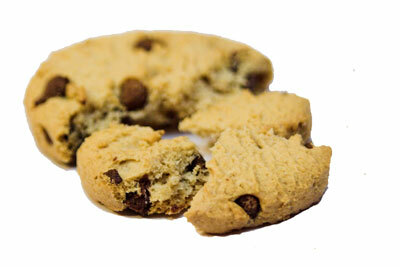 An EU cookie law is a good example of a poor implementation of a great idea. Since the summer of 2012, this law forces EU-based website owners to show an annoying pop-up on their pages, asking visitors whether they want to accept cookies or not. If you are an EU resident, it is very likely that you have seen a few notifications, and in that case you know the negative impact on your browsing experience. 1. To install Adblock Plus, simply go to the website and click the green “Install” button. After the extension has been downloaded, all the ads on the web will be gone, however, some small configuration is still required in order to get rid of cookie notifications. 2. When the extension is installed, please open this link to get an overview of all existing filter lists. Simply look for the “Prebake” filter and click on the link under “subscribe”. This link will open Adblock Plus settings menu. 3. In this menu, click on “+Add” on Google Chrome, and ”Add subscription” on Mozilla Firefox to remove cookie notifications from all the websites that you visit. 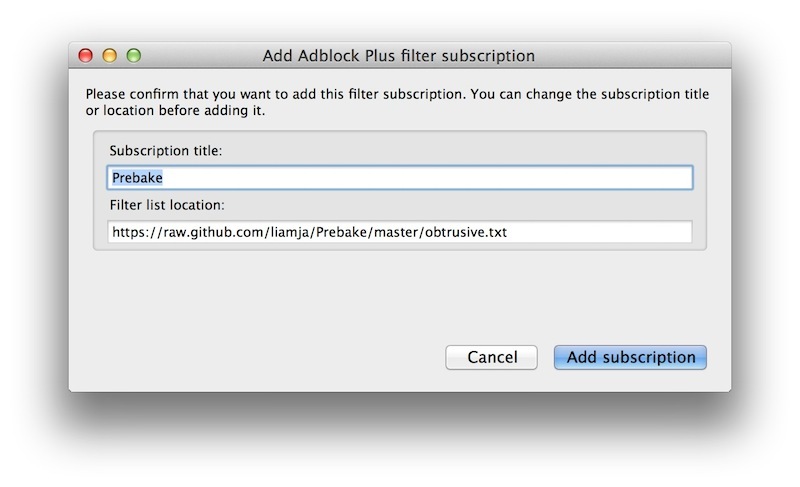 The installed Prebake filter is being maintained by the Adblock Plus community, ensuring it is always up-to-date. Besides blocking the cookie notifications, Adblock Plus also removes all the annoying online advertising from your browsing experience and offers the option to disable your tracking. If you do not want to block ads by only want to block the cookie notifications, you can simply disable Adblock Plus for particular websites, or even completely remove the adblocking filter. Guest article written by: Rutger van Dijk – bio: Open-source enthusiast. Loves to write about Google Chrome, Chrome Webstore, Chromium and Adblock Plus. 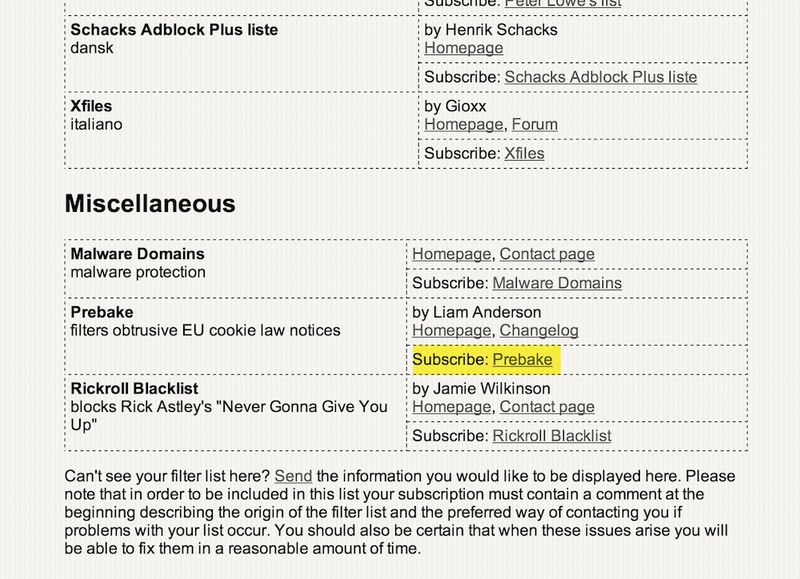 Hi Rutger van Dijk, Thanks for sharing the three very essential steps for blocking annoying EU cookie alerts. This post is very helpful……. Thanks for the tuts, it can be very helpful in Wordpress themes. Such things are always for good. Rutger, this is an excellent tip. Those Cookie pop ups sure are irritating – you’re 100% right about it being a good idea badly implemented! A big THANK YOU!!!!! I was getting mad with those alerts and almost uninstalled chrome alltogether for I was sure it was the browser that messed up soemthing with the cookie settings, and only now I found it was due to the EU law! I tried making Adblock to block this but only here I found I had to subscribe a new filter for it to work 🙂 Thanks again, this was a godsend! Thanks for sharing this post about How to block annoying EU cookie alerts in 3 simple steps. This awesome post inspired me a lot in my work and also I got some useful idea about cookie from this post. Thanks bro for sharing this awesome trick these cookie pop up such a big problem for me and very irritating.Thx for this great tip and keep up this good work. EU cookies can be very annoying, thanks for sharing this tip. If you actually ban cookies for every website how do you think you’ll be able to login to them or use them correctly – so much functionality is restricted by these not existing! The point of this is to prevent the user having to click the accept / close / or others buttons that EU citizens have to do on almost every website. I understand the idea behind the law but politicians should stick to things they understand! That’s the problem: I’m NOT an EU resident, but since it’s just easier for web sites to blanket warn everyone, I have to put up with this cr*p anyway because a bunch of EU politicians are idiots who don’t know anything about how the internet works. I already have enough stress putting up with the stupidity of my own country’s politicians, thank you very much, now I get stress from idiot politicians 10,000 miles away from me too…. this option is no longer available, there is no pre-bake option by Anderson on there, there is a “I don’t care about cookies” option, but that doesn’t seem to do anything useful. There is no “Prebake” option. Tried the “I don’t care about cookies” option, but, it doesn’t work. Next post: HTML and CSS Validation: Should You Validate Your Web Page?